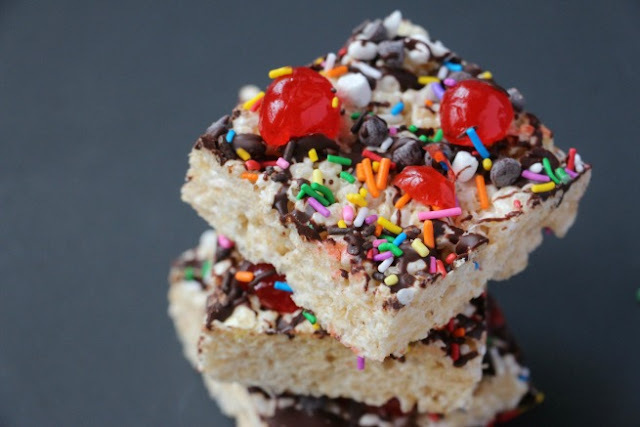 Rice Krispie Treats are a right of passage and who doesn't feel a wave of nostalgia when it comes to these delicious treats? These Sundae Rice Krispie Treats are fun and perfect for ANY party! I love, love, LOVE rice krispie treats! I don't eat them as much as I did as a kid but when I do, I get a little giddy and nostalgic. I have fond memories of my mom making them when I was a little girl. Now that my daughter is a teen, it's such an easy recipe to have her help make with me. to the chocolate drizzled, peanut butter flavor added, and so many other ways to have fun and make each treat unique and fun. 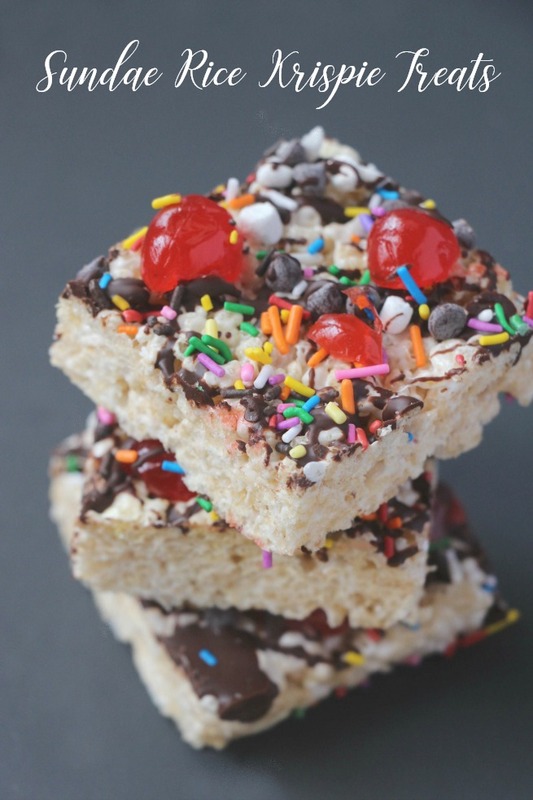 Adorable twist on Rice Krispie Treats! 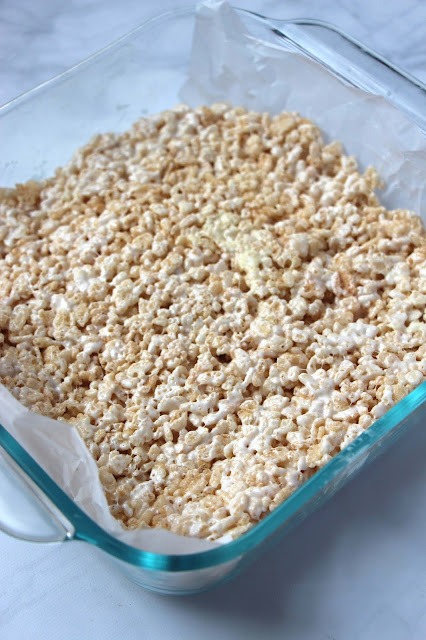 Melt the marshmallows and butter in the microwave in 20-second bursts, stirring thoroughly in between each heating. Add in the Rice Krispies and stir to coat. 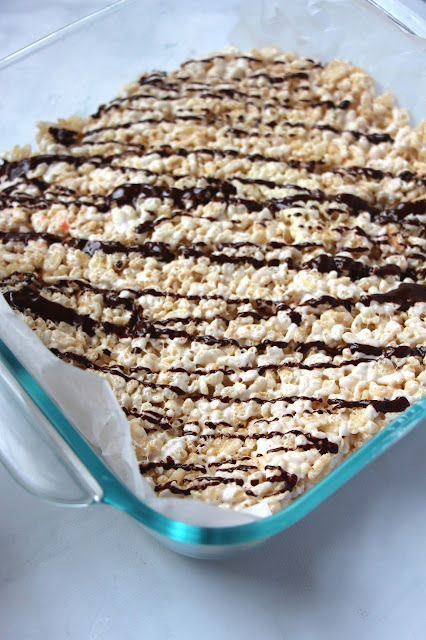 Line a casserole dish and pour the Rice Krispie-marshmallow mixture into the dish. You may want to wet your hands or a spatula to help press down the mixture. Refrigerate while you prepare the remaining ingredients.Melt the chocolate in a small container with the coconut oil. Drain the cherries and cut in half. 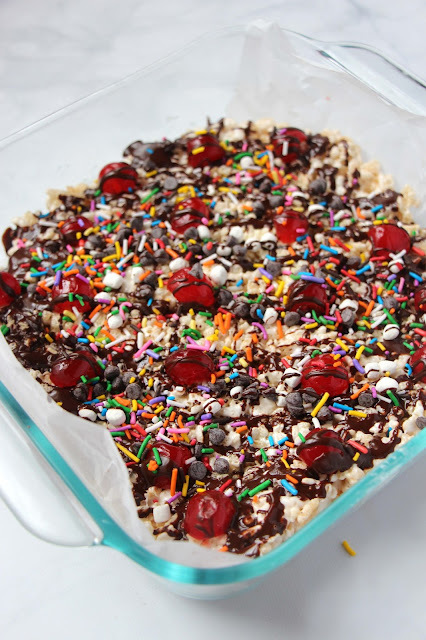 Remove the Rice Krispie squares from the fridge and drizzle on a layer of chocolate.Sprinkle the cherries, chocolate chips, and marshmallows over the chocolate drizzle. Add another layer of drizzle, and then top with sprinkles. Return the dish to the fridge and let set, 1 hour.